In 1727, fourteen parishes in the City of Canterbury were incorporated under a local Act of Parliament (1 Geo. II, s.2, c.20 An Act for erecting a Workhouse in the City of Canterbury for imploying and maintaining the Poor there, and for better enlightning the Streets of the said City ). Local ratepayers met on the last Tuesday in each June to elect a total of 28 guardians to administer the incorporation. The policy of the incorporation was that the workhouse would be the only form of relief for the able-bodied poor. Poor children would be maintained until the age of 14 and then apprenticed out. Beadles would be appointed to remove paupers from outside parishes. 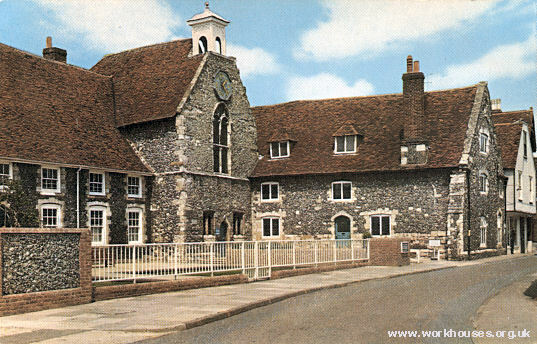 A workhouse was set up in 1727 by converting an existing building known as Poor Priest's Hospital on what is now Stour Street. Able-bodied adult inmates were employed in weaving hop bagging, making their own clothes, and beating hemp. Children performed knitting, sewing, and spinning linen and hop bagging. Because of its local act status, Canterbury Incorporation was largely exempt from the 1834 Poor Law Amendment Act, and continued in operation until 1881. Its constituent parishes after 1834 were: All Saints, Holy Cross Westgate Within, St Alphege [or Alphage], St Andrew, St George the Martyr, St Margaret, St Martin, St Mary Bredin, St Mary Bredman, St Mary Magdalen, St Mary Northgate, St Mildred, St Paul, and St Peter. Staplegate and Thanington Within were added in 1910. 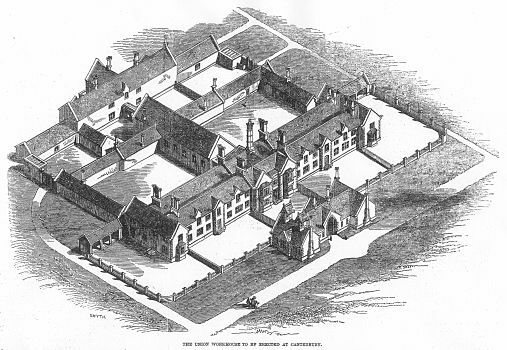 An illustration of a proposed new Canterbury Incorporation workhouse appeared in November 1846 in the Illustrated London News . The design was by SO Foden in collaboration with Assistant Poor Law Commissioner Henry W Parker and was similar to workhouses at Aylesbury and Rye. Parker had lost his job with the Poor Law Commission the previous year following his involvement in the Andover workhouse scandal. The accompanying article in the ILN, possibly by Parker himself, contained much criticism of the PLC and their early workhouse designs which it claimed were based on American prison buildings. The proposed design for Canterbury was much more humane, particularly for the aged and youthful poor, with their exercise yards bounded by open fences rather than high walls, and with covered play-sheds for the children. However, the design actually built by the incorporation was somewhat different in style, although on a broadly similar layout. It was erected in 1848-50 to the south of the city at Nunnery Fields. It was designed by local architect Hezekiah Marshall and was a two-courtyard design accommodating around 400 inmates. The workhouse location and layout are shown on the 1905 OS map. The entrance block faced to the north-west. Canterbury entrance block from the north-west, 2001. There were three-storey cross-wings at each end of the entrance block. Canterbury north-east cross-wing from the north, 2001. At the rear of the main block, a single-storey dining hall divided the courtyard into two, with supervision windows in the canted hub overlooking each. Canterbury dining hall and east courtyard from the east, 2001. On 15th April 1881, the Canterbury Incorporation was reconstituted as a Poor Law Union. In addition to the former Incorporation members, the new union took in a number of extra-parochial places which had become treated as parishes for purposes including the administration of poor relief. These were: Precincts of Black Prince's Chantry, Precincts of East Bridge Hospital, Precincts of Old Castle; Monastery, Almonry and Precinct of St Augustine; Precincts of St John's Hospital, and White Friars House. On 26th March, 1897, the Union was reconstituted as the Parish of Canterbury. 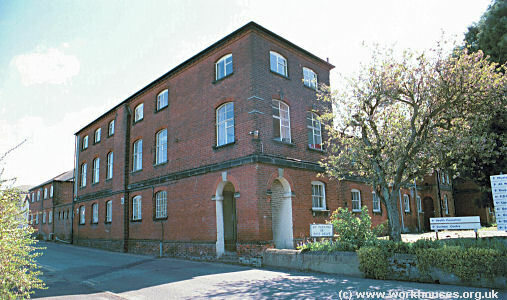 In 1883, a 70-bed infirmary block was built to the west of the workhouse. It was designed by John Cowell and constructed by local builder JC Gaskin and cost about £4,000. 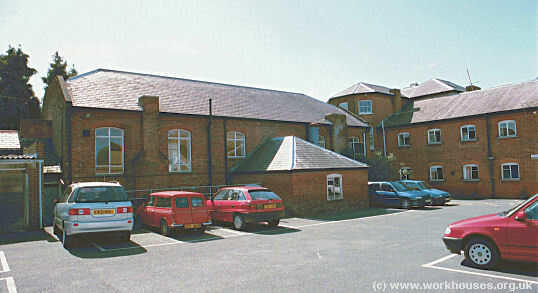 Canterbury infirmary block from the west, 2001. 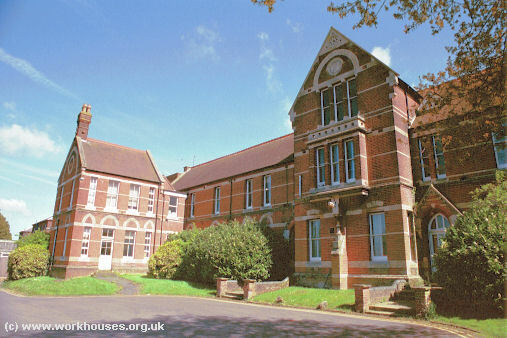 After 1930, the site became a Public Assistance Institution known as The Home, then in 1948 joined the National Health Service as Nunnery Fields Hospital, providing geriatric care. After its closure in 2001, the main workhouse block was demolished but the 1883 infirmary has been redeveloped for residential use. From around 1911, the Canterbury Union operated children's cottage homes at 113 Wincheap, Canterbury. The homes could accommodate 50 children. 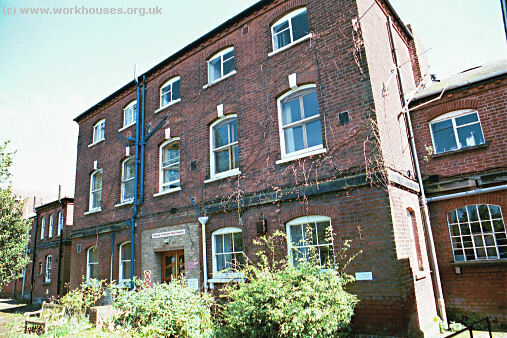 The homes later became the Woodville Homes and in more recent times have been occupied by the Key House Training Centre. Canterbury Cathedral Archives, The Precincts, Canterbury, Kent CT1 2EH. Holdings include: Guardians' minutes (1836-1930); Staff records (1852-1930); etc.